Barack Obama appears to have personally benefited from funds originating in Saddam Hussein's regime. It's a complicated connection, but one that deserves the consideration of Americans voters. Nadhmi Auchi (left) with Illinois' governor, Rod Blagojevich, in 2004. Two similar figures, Nadhmi Auchi and Antoin S. "Tony" Rezko, served as the intermediaries. Both are Middle Eastern males of Catholic Christian heritage who left Baathist dictatorships for Western cities (Auchi from Iraq to London, Rezko from Syria to Chicago). Both became successful businessmen who hobnobbed with politicians and promoted Arab interests. Both have been convicted of taking kickbacks and both stand accused of other shady dealings. Auchi, born in 1937, is the more successful. When young, he joined Saddam in the Baath Party. He founded his main financial instrument, the General Mediterranean Holding SA in 1979 – revealingly, while still in Iraq. A year later, he emigrated to the United Kingdom. GMHSA now describes itself as a diverse group of 120 companies with consolidated assets of over US$4.2 billion. The Sunday Times (London) recently estimated Auchi's personal wealth at £2.15 billion, making him the 27th richest person in Britain. He garnered many honors along the way. On the dark side, a French court in 2003 convicted Auchi of taking kickbacks in the Elf Affair and handed down a suspended jail sentence and fine. One analyst, Hector Igbikiowubo, calls this "probably the biggest political and corporate sleaze scandal to hit a western democracy since World War II." Also in 2003, one of Auchi's firms was accused of taking part in a price-fixing cartel of prescription medicines. In 2004, a report by the Pentagon's International Armament and Technology Trade Directorate found "significant and credible evidence" that Auchi organized a conspiracy to offer bribes to win mobile telephone licenses in Iraq. He was barred from entering the United States in 2005. Tony Rezko (left) with Illinois' junior senator, Barack Obama. Rezko, born in 1955, arrived in the United States in 1974 to study civil engineering. After some work on road construction projects, he went into the fast-food business, then into real estate, with help from Auchi. 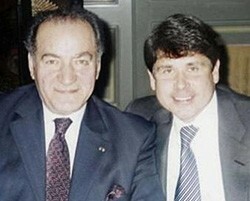 His political involvement began in 1983 with a mayoral campaign, after which he acquired a taste for cultivating up-and-coming politicians, notably Obama and the current governor of Illinois, Rod Blagojevich. Rezko too has extensive legal problems, starting with a June 2008 conviction on sixteen counts of taking kickbacks from companies wanting to do business with the State of Illinois. He also stands accused of evading Las Vegas gambling debts and using false information in the sale of his pizza businesses. In contrast to Auchi's wealth, Rezko is said to be over $50 million in debt. Saddam Hussein made use of Auchi: Auchi's fortune largely grew through his Iraq government connection, much of it sub rosa. In the 1980s, he procured Italian military ships. By 1993, the Italian banker Pierfrancesco Pacini Battaglia testified about Auchi bribing Iraqi officials for an Italian engineering company and called Auchi "one of the most important intermediaries in the affairs of Middle Eastern countries." Auchi is also a major shareholder in BNP Paribas, the French bank deeply implicated in the U.N.'s corrupt Iraq oil-for-food program. Rezko cultivated Obama: Rezko offered Barack Obama a job in 1990, which Obama declined. Still, Rezko persisted, hiring him for legal work and hosting in 2003 an early fundraiser that, writes David Mendell in Obama: From Promise to Power, proved "instrumental in providing Obama with seed money" for his nascent U.S. Senate campaign. Then, on June 15, 2005, just twenty-three days after receiving Auchi's $3.5 million, Rezko partnered with Obama in a real estate deal: while Rezko's wife paid the full asking price, $625,000, for an empty adjoining lot which they then improved, subdivided, and partially sold to Obama, Obama acquired a mansion for $1.65 million, $300,000 under the asking price. Summing up: Barack Obama's house purchase depended on favors from Rezko, flush with a "loan" from Auchi, whose fortune derived in part from Saddam Hussein's favor. When seen in the context of Obama's other dubious connections (Ayers, Davidson, Wright, Khalidi, et al. ), this network is all the more alarming. Oct. 29, 2008 update: Additional details and updates on this subject are available at "More on the Links between Obama and Saddam Hussein." Related Topics: Iraq, US politics | Daniel Pipes receive the latest by email: subscribe to the free mef mailing list This text may be reposted or forwarded so long as it is presented as an integral whole with complete and accurate information provided about its author, date, place of publication, and original URL.